The processing that a grain goes through is what determines whether or not it can be considered whole. When a grain is processed it is stripped of most of its outer shell and other nutrient dense components, leaving just the starchy inner layer that does not have significant nutritional value other than acting as a carbohydrate. The anatomy of a whole grain has three important components to it, which include the bran, the endosperm, and the germ. All of these different parts have unique health benefits to them and they all need to be present for the grain to be considered whole. The outer layer of the grain is the called the bran and it is chewy and fibrous. It contains a large amount of fiber and other nutrients such as antioxidants, iron, zinc, and B vitamins. The next part of the grain is the germ, which is the base for growth for each whole grain kernel. Antioxidants, healthy fats, and B vitamins can all be found inside the germ. The last part of the grain is the endosperm. The endosperm is the soft and chewy middle part of the grain that is left over after the germ and bran have been stripped away through the refining process. This only has a small amount of minerals and B vitamins and mainly acts as a source of carbohydrates. Grains that have all three components (bran, germ, and endosperm) can be considered a whole grain. If it’s missing one or more components, then it is considered a refined grain. An easy example would be brown rice and white rice. Brown rice is a whole grain because it is still covered by the bran and has the germ intact, making it more fibrous and tougher to chew. White rice is a refined grain because it has had the bran and germ removed leaving just endosperm which is soft and easy to chew. Now that you know more about whole grains and how they are classified, let’s look at some of the health benefits of grains and why they are an essential part of a balanced diet. One of the major benefits of whole grains is their ability to reduce your chances of developing cardiovascular disease. The fiber in whole grains is essential for preventing cardiovascular disease, because fiber has been shown to lower triglycerides, cholesterol; it can also help regulate insulin levels. All of these different effects help to lower the chance of developing cardiovascular disease. Whole grains can also be protective against type 2 diabetes; because whole grains are low on the Glycemic Index they do not cause your body to release a surge of insulin when eaten, rather they cause a steady release of insulin. The nutrients and fiber in the whole grains also help with insulin sensitivity which greatly help to reduce blood sugar spikes. 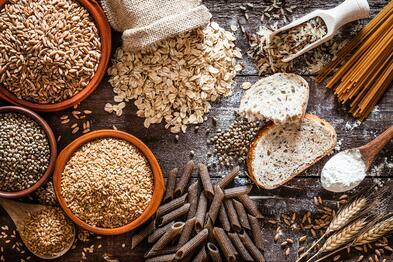 Health Bonus: Whole grains can also help with digestive health. All of the fiber and other nutrients in grains can help with healthy bowel movements and reduce the chances of constipation. With all of these health benefits and disease fighting properties, whole grains should become a staple in your diet. Start to reduce your intake of refined grains and start looking for grains that labeled as being whole, such as: whole wheat bread, brown rice, and quinoa. Your body will thank you!